March 26, 2018, 10:30 a.m. This month, Nationwide is the brand with the biggest uplift in its Ad Awareness in the UK. The building society launched a high-profile campaign, using prominent print ads on billboards and London’s tube network as well as national TV adverts. It is the second time in six months that Nationwide has topped YouGov’s advertising rankings. Its current campaign features singing sisters Flo and Joan and focuses on a theme of loyalty and close family relationships. The ad seems to be cutting through. 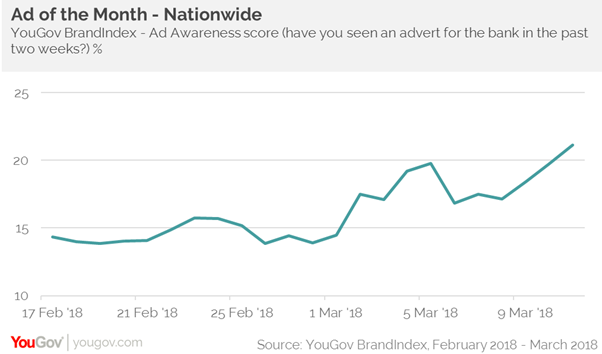 YouGov BrandIndex shows that the brand’s Ad Awareness score (whether or not someone has seen an ad for the brand in the past two weeks) has jumped 10 points, from +14 to +24, in the past couple of weeks. The sisters’ performance for the building society has caused a stir, with Nationwide’s Buzz score (whether someone has heard anything positive about the brand) moving from +2 to +9. However, the advert has not escaped criticism from certain viewers, with some taking to social media to express their disdain towards the pair. Certain messages were thought to be threatening, prompting Nationwide to say they would be talking to police in order to tackle the online abuse. The brand’s response seems to have resonated with its users. Among current customers of Nationwide, its Impression score (whether someone has positive or negative impression of the brand) has risen by 10 points from +63 to +73 since the bank responded. The building society can be content that its campaigns are being noticed, despite the sometimes mixed feedback. Added to this, the brand remains at the top of the high street banking sector among the general public. Its response to the online abuse of its advert’s stars may well have reminded its customers of its shared values and of the ethics that the company wants to promote.